TYPAR is a leading supplier of ground and soil reinforcement products such as GrassProtecta, TurfProtecta, Typave 25 and BodPave 85. GrassProtecta™ grass reinforcement mesh is a thick plastic mesh supplied on a roll that is installed directly onto existing grass to protect, reinforce and stabilize the grass against damage caused by traffic. 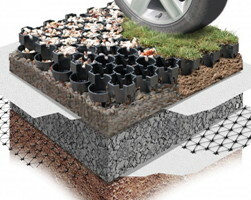 Bodpave®85 grass pavers / paving grids are a strong interlocking 100% recycled cellular porous plastic paving grid system for grass reinforcement, ground stabilisation & gravel retention. Click here to visit Boddingtons' website.